Since you protect something very special. STABILITY - Constructive solutions and innovative manufacturing processes ensure a solid overall dimensional stability. SAFETY - Reliability and safety in terms of maintaining sterility on the principle of “Pasteur loops”. RELIABILITY - Intuitive, reliable, time-saving and safe handling for stress-free working. LOGIC - Logically organised from A to Z, with smart components and accessories compatible with the system. HYGIENE - Cleaning-friendly and hygienic properties. 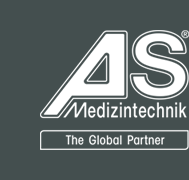 We are AS Medizintechnik and that's what we stand for. The technical competence of our staff, based on years of experience in medical technology, guarantees comprehensive and reliable service to all of our customers. Over 20.000 articles cover the entire spectrum from general surgery to specialised disciplines extending to the supply and disposal of sterile products. Products manufactured primarily in Tuttlingen form the basis for our high level of quality. One of our main strengths is the ability to offer excellent value for money. You are not authorized to download datas!